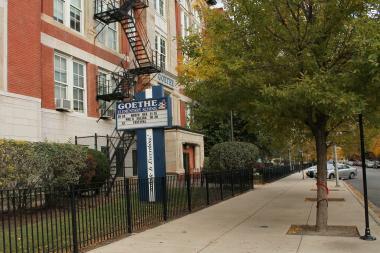 Goethe Elementary, 2236 N. Rockwell St., is just one of the many public schools in Logan Square to see its budget slashed in midyear cuts. LOGAN SQUARE — Public schools in Logan Square will be forced to slash about $1 million from their budgets as part of the district's emergency midyear budget cuts. "Although we knew this was always a possibility, it's still a really hard hit, a punch in the gut," said Christine Dussault, third and fourth grade teacher at Chase Elementary, 2021 N. Point St. In the latest round of cuts, Chase stands to lose $93,104, or 1.86 percent of its budget, according to data provided by CPS. The elementary school, which enrolls mostly low-income Hispanic students, was already struggling to make ends meet. As a result of previous budget cuts, the school was forced to get rid of its art and music teacher, as well as after-school programs. Now, after the most recent cuts, the school can no longer buy enrichment books and pay teachers for coming to additional staff meetings, among other costs that are still being determined, according to Dussault. "Right now we're in survival mode. We will find a way to make do with the bare minimum," said Dussault, who has been teaching at the Logan Square school for six years. Budget woes have forced Chase to get creative when it comes to funding. In fact, finding outside funding has become so common there that teachers and staff have basically become part-time grant writers, Dussault said. "All this time we spend writing grants and begging people for money, this is time away from the students and building ourselves up as educators," she said. Chase wasn't the hardest hit public school in Logan Square. Marine Leadership Academy, 1920 N. Hamlin Ave., stands to lose the most at $227,402, or 2.79 percent of its budget, according to data provided by CPS. The cuts aim to fill the hole blown in the district's budget by Gov. Bruce Rauner's veto of $215 million officials had been counting on, the district said. This is the second year in a row Chicago Public Schools officials have cut schools' budgets in the middle of the school year. CPS had counted on the $215 million vetoed by Rauner to pay employees' pensions when that bill comes due in the summer.